The other yellow status indicator as of 12/31/2013 was government fiscal policy, more precisely the rate of growth in government spending. It may come as a surprise to investors, but the yellow status is actually a result of the increase in government spending being too low, not too high, at the beginning of 2014. Government austerity is a deflationary force on the economy. The last time the government decreased its rate of spending growth to zero or below was in 1946, and a major market correction did occur in that time period. Since that time, however, the rate of increase in government spending always increased at a healthy pace, until 2012 and 2013, and was usually more likely an inflationary rather than deflationary instigator. Other than the unknown budget busting potential of the Affordable Care Act, the present growth in government spending appears to remain on course to stay well below historical levels in 2014. During the 3rd week of 2014 the major market indexes all showed increasing weakness, with the DOW dropping below 16,000 on 1/24 while posting a 300 point drop, more than 3.5%. The pull-back in the markets for riskier assets was not entirely a surprise to market investors, coming on the heels of a year in which the S&P 500 posted a 29.7% gain, and the DOW was also up over 20%. But the severity and quickness of the downward move in the DOW, in light of the repeated poor revenue growth projections by many DOW component companies which do not reflect an economy that can justify such large upswings in equity advances, is cause for heighten concern. Because of the accelerating pace of decline in the stock indexes, the DOW signal was moved to a cautionary status. If the major indexes continue to slide, which is the current momentum trade, and approaches 15000 within the next 90 days, the signal will move to a clear red status. There was one additional change made to the Financial Relativity Index on 1/24/2014. 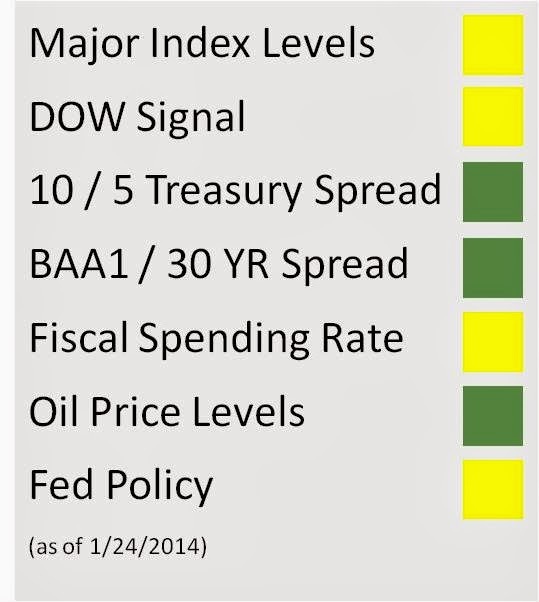 On 12/31/2013 the Index showed Fed policy green light. This green signal was tied to co-operating interest rate markets which pushed the 10 year to 3% at year end and the 30 year Treasury up to almost 4%. The risk spreads remained aggressively upward sloping, and a movement toward historical norms. However, the market trade since the first day of 2014 has been decidedly risk-off, propelled more in favor of less risky assets with the poor jobs report on January 10th. 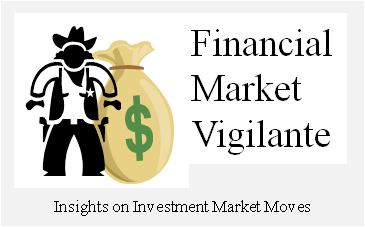 The market spreads tracked by the index are still green, but investors need to remain vigilant because of two nuances which are showing up in the data. One, the 30 year Treasury yield is collapsing on the 5 and 10 year at the present time and the 10 / 5 Spread is narrowing. In other words, the yield curve is flattening as investors take cover in Treasuries. The second trend to take notice of is that the BAA1 / 30 Year spread, even though the corporate yield fell, still widened in the last week. Why the sudden change of risk tolerance by investors? Historically the stock market begins to show stress “cracks” due to heightened inflationary pressures and an over-heating economy. However, the seeds are in place for a truly different downturn thanks to the current Federal Reserve monetary and U.S. fiscal policies. It may be difficult for many to comprehend, but QE, rather than generating inflationary pressure, is actually doing the opposite – it is creating a deflationary sink-hole. The inflation data over the past 4 years clearly reflect deflation, not inflation, with the exception of asset bubbles where values are at odds with economic reality, is the real pernicious force in the economy. The reason this phenomenon is happening is that high quality financial collateral is being withdrawn from the world market and placed on the Fed balance sheet, and locked up in the Federal Reserve banking system as excess reserves, currently to the tune of $2.4Trillion dollars. These excess reserves are not lendable in the traditional sense of monetary creation, or even provide collateral for the shadow banking sector, and therefore cannot ignite inflation. The lower level of high quality collateral is having a direct and measurable impact on investment – capital investment in the U.S. economy, and most visibly economic growth and monetary stability in emerging markets. The Fed playbook using further QE to spur economic growth in the U.S. through lower interest rates seems to be reaching an obtuse turning point - a point in which actually continuing the policy might drive deflation up, not down. Economic growth requires investment, and investment requires lending. Currently the Fed policy and government regulation environment in the U.S. are constraints on both. Therefore, whereas the Fed policy historically reaches a cautious stage because the yield curve flattens when the Fed increases short-term interest rates, in the new Fed driven era, the yellow flag is being raised because the yield curve is flattening due to a tightening credit environment caused by rationed collateral resulting from excessive Fed QE. 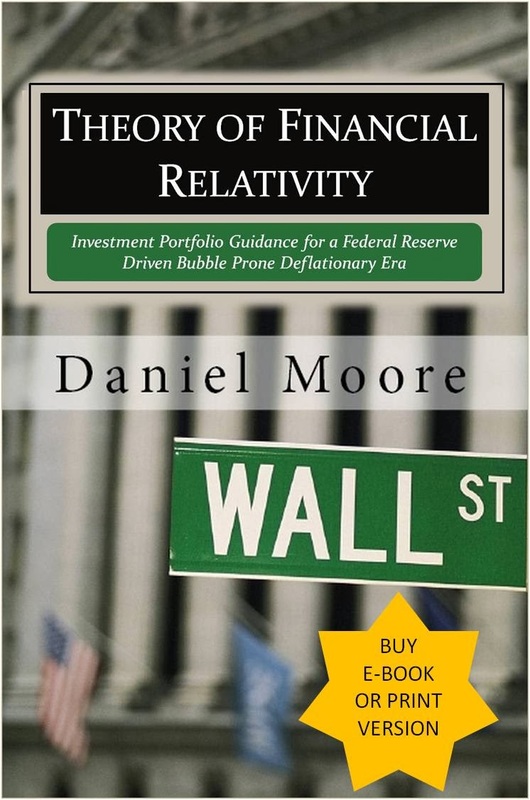 To help investors looking for a system to track the health of the U.S. financial market, the Financial Relativity Index has been created based on a set of leading indicators derived from the research contained in the book, Theory of Financial Relativity. The index is a heuristic used to gauge the relative attractiveness of investing in stocks at a given time based on the interaction of major market forces and the resulting impact on the rate of change in the price levels of stocks (DOW Signal), money (Interest Rate Spreads) and energy (Oil). As explained in the investment research book, all of the signals in the multivariate model possess characteristics which have a high probability of being exhibited prior to a market correction; and likewise remain within certain parameters when the equity market is more attractive as an investment such as during a post recession rebound or an economic expansion. The more yellow and red the multivariate index becomes, the higher the probability of a sustained and deep market correction becomes. Wow! It is a wonderful and fundamental website about financial markets. It is very useful for us. So, I loved it. Many, many thanks to you for creating such an informative website. If you would like more information about this please visit stock symbols The advantage of these stock symbols is they allow for a vast amount of customization by the user. That same advantage can create a disadvantage for some users. Those users may not really know what they are looking for or what data criteria might produce a stock symbols of stocks that present the highest possible probability of a successful stock trade.